Let’s get one thing straight: a negotiation that you’re not prepared to walk away from is not a negotiation – it’s surrender. It’s all give and no get. When David Cameron tried to renegotiate Britain’s EU membership, he was sent packing because Brussels judged (rightly) that he’d never actually back leaving. And since then, Brussels has made no real concessions to Theresa May because it judges (rightly, it seems) that she’s desperate for whatever deal she can get. But even after two years of fearmongering and vacillation, it’s not too late for robust leadership to deliver the Brexit that people voted for. It’s time for Britain to announce what it will do if the EU can’t make an acceptable offer by March 29 next year – and how it would handle no deal. 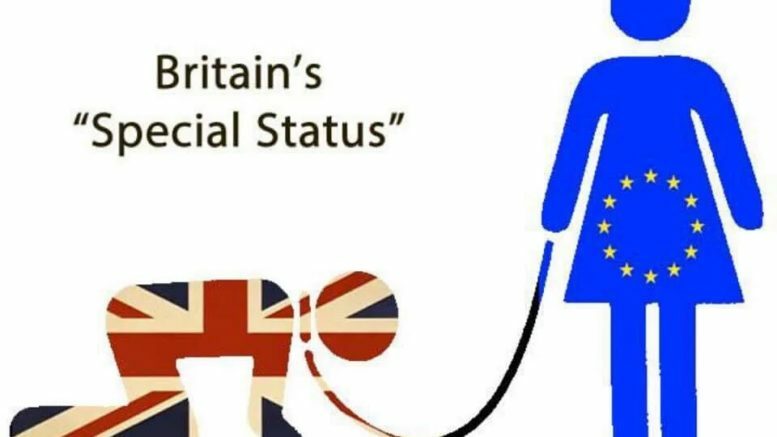 Freed from EU rules, Britain would automatically revert to world trade, using rules agreed by the World Trade Organization. It works pretty well for Australia. So why on earth would it not work just as well for the world’s fifth-largest economy? Next, the UK should declare that Europeans already living here should have the right to remain permanently – and, of course, become British citizens if they wish. This should be a unilateral offer. Again, you don’t need a deal. You don’t need Michel Barnier’s permission. If Europe knows what’s best for itself, it would likewise allow Britons to stay where they are. Third, there should continue to be free movement of people from Europe into Britain – but with a few conditions. Only for work, not welfare. And with a foreign worker’s tax on the employer, to make sure anyone coming in would not be displacing British workers. Of course, the EU might not like this British leap for independence. It might hit out with tariffs and impose burdens on Britain as it does on the US – but WTO rules put a cap on any retaliatory action. The worst it can get? We’re talking levies of an average 4 or 5 per cent. Which would be more than offset by a post-Brexit devaluation of the pound (which would have the added bonus of making British goods more competitive everywhere). Be the first to comment on "Brexit – A view by former Australian PM Tony Abbott"